Time for a little giveaway! My giveaway bag from the Canadian Design Bloggers meetup contained issues of my two favourite home decor magazines, Style At Home and Canadian House & Home. I already subscribe to these magazines (seriously, they are that good) so I'm giving these issues away to you! If you're a Sarah Richardson fan (like me!) you'll want to get in on this. The House & Home issue contains an article on her country house from the latest season of Sarah's House (that's her cute daughter on the cover). 1. Receive one entry for leaving a comment below. 2. Receive one entry for becoming a follower & leave a separate comment below to let me know. If you're already a follower, leave a comment below. The winner will receive both magazines. You have until midnight November 27th to enter and I'll announce the winner on November 28th. Sorry, due to shipping costs, this contest is limited to residents in Canada and the continental U.S.
oh i love sarah - she is the best!! I just started reading your blog about a month ago, and you've made it on my google reader! I love your blog, and I love those magazines =) (and I just bought my first house). Fun! So glad you're willing to post to the US. I recently became a follower and love reading your posts! Also your blog is very nicely organized and I love all the pictures! Would love to peruse these magazines! Oh, I so love Brit magazines, and Canada's magazines are a close second!! I've been a fan of yours since your WBells days! Since moving to Brooklyn, NY I miss these mags, and it would be a great way to keep connected to style and decor back home in T.O. I'm keeping my fingers crossed for the early x-mas gift. Thanks, Jenn! I just added your blog to my google reader (it was about time)! I love looking at Canadian House & Home's website...I can just imagine how wonderful it is to flip through the glossy pages each month! I joined as a follower! Love this - Following you now! We're in sync... I was just looking at my extra magazines this morning - thinking perhaps I should give them away via my blog -and, look at you! and i follow you on google reader! I am an inspired follower, and would LOVE these magazines! I always felt if I got at least one good idea from a magazine, it was worth the price of the magazine. I have a feeling I would get MANY good ideas from these magazines, and you can't beat FREE. Thanks for the opportunity! I'd love some new magazines because all of mine just expired! I've been following your blog for years and it's one of the first ones I read in my reader. Perusing shelter mags is definitely a guilty pleasure (blogs and Dr Pepper are the other two). I look at the Canadian mags online, but you can't beat having those glossy pages in your hands! I am an RSS follower and I would love these subscriptions! Pick me! Pick me! I've been wanting Canadian H&H but couldn't justify spending more money on a mag. subscription. I'm also a fan. Love your blog. I love the kids kitchen you made. It's so cute! I hope I win Jennifer! I used to subscribe to both but cut them out to "declutter my life" for a little while. (but I still yearn for a glossy magazine fix once in a while). Oooh, Ooooh ME!!!!!! I would LOVE both these mags, our house needs the help!!!! Although (and don't shoot me! ), I don't like House & Home as much now that Cobi isn't the editor anymore. Oh, and I follow you on Twitter!!! Love your feed- I can't believe you got a shout out from Joe Fresh Style for your blog post about them! Hoping to get a subscription for Christmas! Awesome giveaway! I love your blog! Sarah Richardson is the BEST! I look to her work for inspiration during the renovation of my first house. A daunting process but feels so good when we accomplish something. oh man - I love Sarah Richardson. I have most of her Country House episodes recorded and I love to play them and pause - play and pause - repeat. !! both magazines ROCK - love them and we're about to do major renos so i could use the inspiration too!!! OMG Sarah Richardson is my idol! anything sarah richardson related is a fave of mine. the mag pictures alone are fantastic. thanks! Ooh! I love Sarah Richardson (and I'm a follower). Canada has the best shelter mags. I would love these! I'd love to get my hands on those! I can't them in my town. Oh! me! me! me! I (heart) you!!!! I love Sara Richardson...loved seeing her at the Tassimo Talk Event too! I would love to win these magazines and spent a few hours snuggled up on the couch reading. I love sarah r! she is an inspiration! i am one big Sarah Richardson fan. If you were to look at the list of recorded shows in our PVR, you'd see tons of Sarah's shows :). And I hardly delete them. I've been a follower for a few months now and you never cease to amaze me! ooooo, I lurve Sarah Richardson! I've also been a follower for some time now and love the blog, thanks!! I love Canadian House & Home's website so I'm betting I'll love their magazine. I'd love to read that article about Sarah's house. Thanks for the giveaway, I love Sarah! I'd take some free mags any day! I love Sarah RIchardson! and your blog! I've asked for SAH as well this year! Oooh how I'd love to sneak away for a long bath with these two! I love Sarah....and I am a follower! 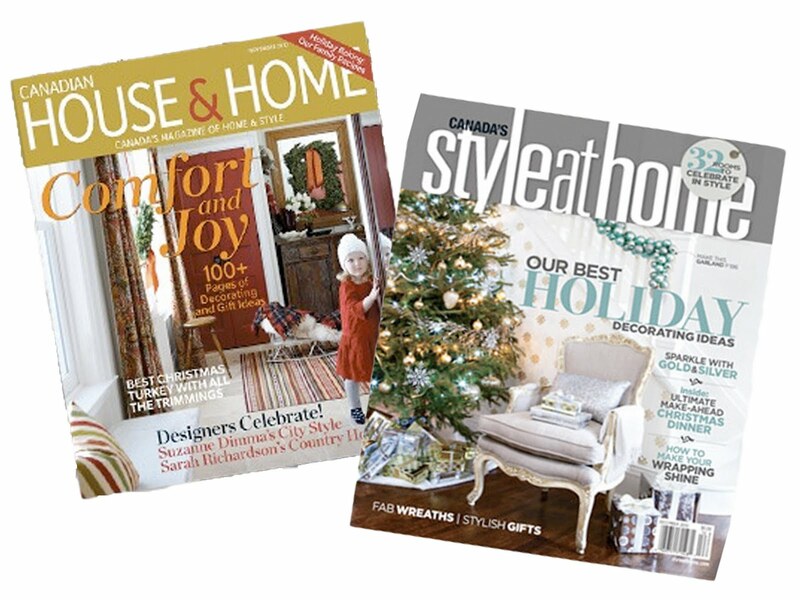 I love Sarah's House AND decorating magazines, so the giveaway is a perfect combination :-) FINGERS CROSSED! I loooooooove these mags too...especially since they're Canadian! Woohoo! Just recently discovered your blog. Love that you're from Canada!